Preparation time: 25 minutes. Baking time: 35–40 minutes. Preheat oven to 350°F. Combine 2 tablespoons chili seasoning mix and flour in a large zip-top bag. Add pork chops, seal bag, and shake to coat well. Coat a large, nonstick skillet with cooking spray, add oil, and heat until oil is hot. Add chops and sprinkle with remaining coating. 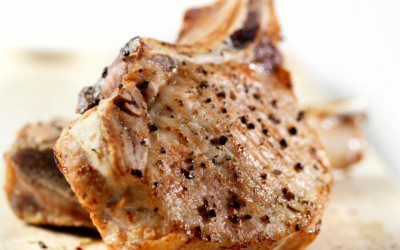 Brown pork chops quickly over medium-high heat (about 3–4 minutes on each side). Remove from heat and set aside. Coat a 2-quart casserole dish with cooking spray; set aside. In a large bowl, stir together remaining 1 tablespoon chili seasoning mix, rice, water, and tomato sauce. Pour into casserole dish. Arrange pork chops over rice and sprinkle with onion, yellow pepper, and green pepper. Bake, covered, for 35–40 minutes, or until rice is bubbly and pork chops are no longer pink in the center. Exchanges per serving: 2 starch, 1 vegetable, 4 very lean meat, 1 fat. Carbohydrate choices: 2 1/2.